I reckon this dish--meat fried with a kind of basil leaf, garlic and chilies--is the closest equivalent to Thai "comfort" food. It's quick, nourishing and delicious, and is available just about everywhere. 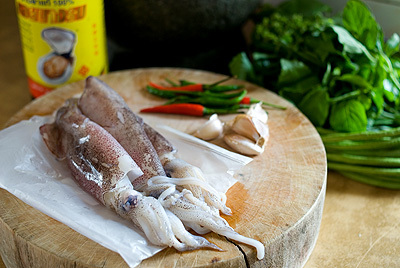 You can make it with virtually any meat or seafood, although I've decided to use the ubiquitous (and delicious) squid. 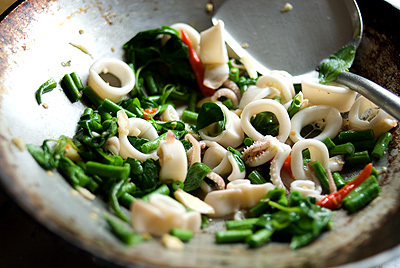 A couple things to keep in mind when making phat kraphrao at home are that you'll need bai kraphrao (holy basil, the dish's namesake), not bai horaphaa, Thai basil. 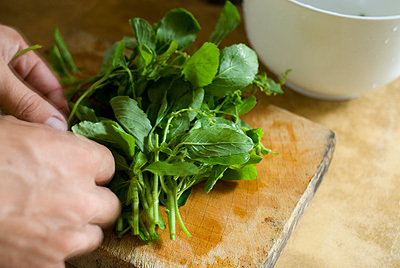 Bai horaphaa, although more familiar to most people, is almost only eaten raw, or as a garnish. Bai kraphrao, on the other hand, is always cooked, and it's bitter-spicy flavour is a world apart from the sweet, anise-like taste of bai horaphaa. Also, ideally you'll want a hot, preferably gas or propane stove to make this dish. The idea with this dish is to cook it quickly and at a high heat to allow the ingredients to remain fresh and crispy. 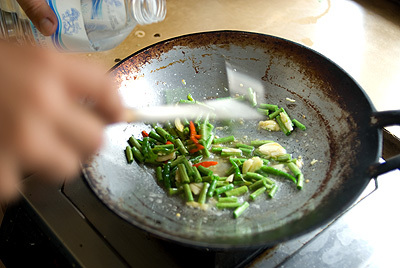 If you really know what you're doing, you can also tilt the wok and "ignite" the dish while cooking in order to impart a delicious smoky flavour (shown below). If an electric stove is all you've got, then by all means go ahead, but the relatively low heat means that the dish will inevitably be slightly soggy and overcooked. And as always, I'm not going to tell you how much seasoning you need to put into the dish. I recommend adding fish sauce a teaspoon (or small glug) at a time, tasting after each addition to make sure you've added enough. For reference, phat kraphrao should be slightly salty and spicy, so feel free to indulge. And if after cooking you've found it's not spicy enough, you can always make a quick bowl of phrik naam plaa, sliced chilies and garlic in fish sauce, a typical accompaniment to this dish. 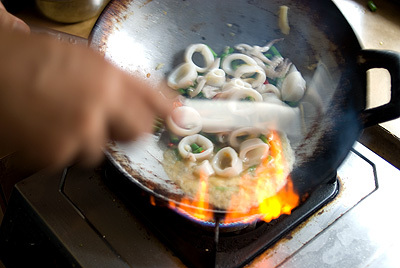 Begin by cleaning and preparing your squid (if you're not sure how this is done, go here). Slice into thick rings and set aside. 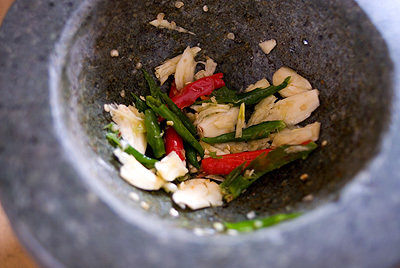 Prepare your mise en place: within reaching distance of your wok, place a bottle of fish sauce, a bowl of sugar and a bottle of water. 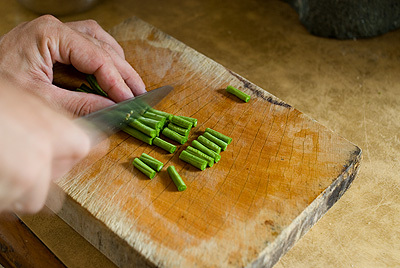 Have all your ingredients close at hand, open and ready to throw in the wok. The entire cooking time of this dish should be no more than a minute, so you won't have time to be hunting around for things once you've begun. Add a tablespoon or two of water if mixture is beginning to dry out, and toss in a haldful basil (don't worry if this looks like too much; the basil shrinks considerably when cooked). 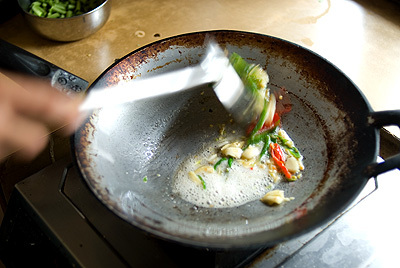 Stir thoroughly to combine, taste and add more fish sauce or sugar if necessary. Fry until basil is just wilted but not limp, about 15 additional seconds. Serve phat kraphrao steaming hot over hot rice with a fried egg on top, if desired. Repeat with remaining ingredients.